It's pretty much always tape-tastic around here, but the last few weeks have felt especially tape-filled. Here's a look at what's going on around here - well, at least according to Instagram! 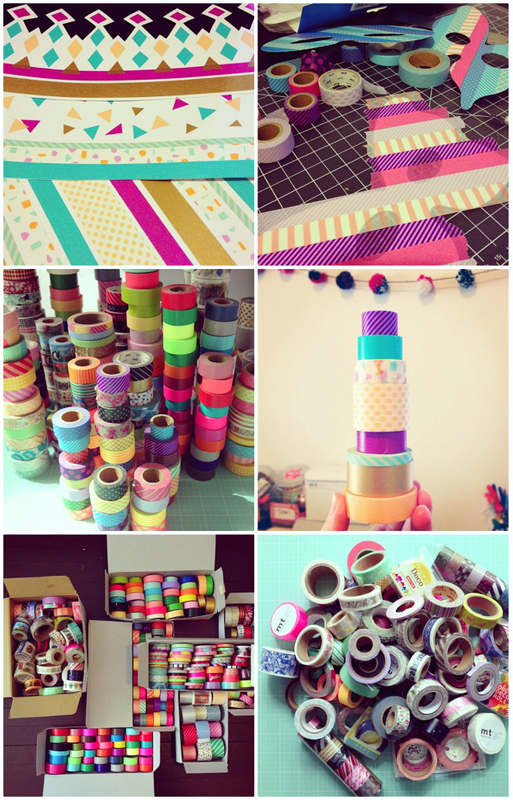 Lots of tape projects happening - but that's not really new! I spent a bit of time sorting through all the loose rolls currently on-the-go and getting them organized into boxes so that I could see them all. Bad news is they're already back in a jumble. Good news is I found a big pile of unused photo samples and other random rolls - new washi tape grab bags will be coming soon! It's also been a busy few weeks tape-order-wise. Our washi tape cuties will be restocked soon. New and restock MT tapes are on order. Plus a brand new line of tape that I'm really excited about. Like really really haven't been this excited about tape in a long time excited. They're so good - I hope you love them too! Loved reading all the responses to our latest giveaway over on Facebook and Instagram - it's always wonderful to receive feedback about what you'd like to see in this space and in the shop. More DIY's, more tape, more rubber stamps, more stationery and great pens seem to be the running theme. Plus some other great suggestions that we're already starting to look into! How about you? Do you have any suggestions for things you'd like to see here on the blog or products you'd like to see in the shop? We'd love your input! Thanks for the feedback Carla!